After that big of amazing cooking by Dan last night, I think I mentioned I continued to indulge in the wines as the night wore on. Suffice it to say, a rich and filling breakfast was necessary the next morning. It was weird. I haven't been hung over in a long time. But I was a little bit this morning. So fortunately, Meena came swooping in and rescued me from the hangover blues with this lovely little breakfast. And then she grilled up some Canadian bacon and sliced up some challah toast. The toast got a healthy slathering of jam and nutella and we were in business. This got me back on track in delicious fashion. That's right, it's more than just a burger. It's a Strassburger. And it's simply amazing, folks. 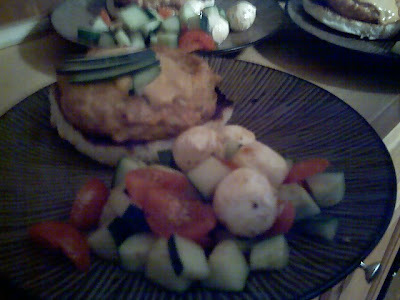 One of the last times we had salmon burgers over at Dan and Steve's, Dan did NOT play it conservative with the salmon. He gave us what can only be described as the most plentiful burger in the history of seafood burgers. I'm not saying it wasn't good. It was. It was just HUGE! This time, Dan cut the portions back a little and just killed the flavor. And I mean that in a good way. He knocked it out of the park. I can't remember what he put in there (because we went on to drink copious amounts of wine on the back porch following our burger enjoyment), but suffice it to say, this little baby topped off with some cucumbers and a bit of chipotle mayo was out of this world. In addition to the burger, Steve and Dan teamed up to build us a little cucumber salad with some nice bits of baby mozzarella and tomato. This was an awesome meal. Perfect for a Friday night in the backyard, drinking wine and laughing a lot. I don't know if it's any big deal, but I do like salmon very much and I've decided I've become pretty good at cooking it. I still use that lovely method I read about in Heat and it hasn't failed me yet. I know it's just boring old salmon, but I love it and we think it's delicious! And that's about it. The salmon just got the ol' season the pan, flip once method. And it came out just crisp on the outside and perfectly creamy and delicious on the inside. The final step was giving the fish a quick pinch of black sesame seeds and a small drizzle of sesame oil. It might not look like much, but really was wonderful. The mashed potatoes had that slightly fruity flavor from the avocado. The salmon was creamy but just slightly nutty from the sesame oil drizzle. Oh man. It's 7:45 in the morning and I sorta want to eat this again right now. Claiming to love this meal would be an out and out lie. I didn’t. I didn’t love it all. I didn’t hate it. But I didn’t love it. I’m reasonably sure Meena felt the same. And although it’s totally my fault, there were a few circumstances that will allow me to hold my head high as I stride back into the kitchen tonight. One, when I was envisioning this on the way home, I had dinner rolls in mind – not those terrible hot-dog rolls I was forced to use. And two … well, there isn’t a two. The rolls ruined it. I feel like I have something here. This just wasn’t it. I have this idea to do mini muffaletta. And this wasn’t really a trial run, but maybe just … like sticking a toe in the water of the muffaletta pool. Anyway, I’ll get better before I unleash that monster. The first was better than the last. I liked the manchego, but I should have gone with my gut and done a balsamic reduction. And the buns were so bad that the second offering was so completely dry it almost wasn’t worth it. Anyway, when the muffaletta comes around, hopefully I’ll have something a little more appetizing to share. I woke up at 4:00 a.m. yesterday to fly home from Indiana and go straight to work. Suffice it to say, when I finally got home, I was about as tired as I've been in a very long time. And what do we do when we're totally tired and done with it all? Lobo, of course. Cheap, delicious, satisfying and I didn't have to lift a finger. Thank you, Lobo. Thank you. Sorry for the terrible lack of updates, friends. I think I may have noted it, but if not, I’ve been in Indiana for the lovely 500-mile automotive race they host there every year. It’s a wonderful time. I do recommend it if you ever get a chance to stop by. Anyway, I’m not going to break it down line-by-line and post-by-post, but I’ll just give you a few highlights from the weekend. - sandwiches, chips and wine at mom’s lunch counter! I ate and ate and ate. Which is typically the routine when I’m home. So nothing new. But it was lovely and wonderful and amazing. And I’m for sure going to try the lamb chop recipe Mom and Dad picked up from the Huses. It’s a nice little mustard bite that isn’t too powerful for the fantastic flavor of grilled lamb. And the salad dressing mom makes with sugar and white balsamic vinegar is one of the finest things on the planet. That one will likely become a staple as well. Man, it’s good to go home. So I'd seen all these recipes touting the brillance of using canned salmon in salmon burgers. I typically use a fillet from the store and chop it all up, but after hearing so many positive reviews, I figured I'd give it a shot. Well, never again. I'm not sure what the deal was, but I didn't like it. They didn't bind properly and the taste just wasn't the same. We used nice, canned sockeye, but the results were just OK at best. And then I grilled these joints off on a hot pan with a little olive oil and served them up with liberal amounts of avocado and tomato on a baguette. Who knew, right? Well. I mean, not a real flavor profile breakthrough I guess. But I'd never made it before and I liked it. That's alls I'm sayin'. Anyway, back to Indy tonight, so it might be a day or two before updates! Last night was the continuation of a really amazing week for me. After the new job, Chestnut and seeing Iron Man, I didn't think it could possibly get much better. But it did and it was all thanks to Steveo! That's right. Our man Steve hooked us up with a couple amazing Yankees tickets and we were fortunate enough to witness the bombers plow through the O's. Pretty amazing. Meena wasn't that into her cheesesteak, but it wasn't too bad. My hotdog was the clear winner. But I mean, are you surprised? It's a giant hot dog piled high with hot sauce, kraut and relish. Oh, and mustard. Brown mustard. Sheesh. That's a little bit of spectacular on a hot, crusty bun. A-Rod homers, solid pitching from Mr. Rasner, great seats and the most satisfying, fatty food around. Amazing night. After my first night of work, Meena made sure my life was perfect — she took me to Chestnut for their excellent Tuesday night prix fixe extravaganza. This deal is an exceptional one. Appetizer, main course and desert. One low price. All the same great Chestnut excellence in the kitchen. Pretty outstanding. I think as always, the hanger steak is the real winner. And I would have picked up the pork chop I love so much, but the halibut was lookin' nice and I got a little more bang for my prix fixe buck. So I'm happy. Wonderful first day. Tomorrow night? Yankees game!! I had an event for the new job last night so Meena called in a little delivery and kept it real until I got home. It wasn't a very late night so I was home pretty early to enjoy a little bit of Joya's finest. Meena asked for mine extra spicy and they definitely delivered. It was pretty much a five alarm fire in that sleek little delivery tray. But really good. The spice was perfect with the salty pork and the little lemongrass pop of the broth it was all submerged in. I had a few things I needed to do in the city on Sunday, so Meena took the culinary reins and got some serious comfort food going for that evening's eats. While I was away she stopped into the butcher for some Italian sausage and paid a visit to the bodega for delicious beer. We slapped those suckers on a couple buns with mustard and pickled peppers and it was pretty much amazing. With a couple of fries she picked up, it was about the best way to close out a weekend. Ever. Sunday morning felt prime for another little tango with some eggs, so as soon as I got up, I got started on the situation. Well, it was pretty mundane, but I have to admit, both Meena and I really enjoyed it. Simple, small and gone in a matter of seconds, but it was pretty fantastic. After all the fun from the wedding a few weeks back, James and Diana were nice enough to have a ton of us over for a nice little party to commemorate all the fun. Of course, D went completely nuts in the kitchen and pulled off one of the more amazing menus I've had the pleasure of enjoying in some time. Amazing. Everything was really lovely. Tofu was great. Steak was awesome. I can't even really describe it. It was all amazing. Thanks, D! I ran out Saturday morning for a couple of quick supplies for breakfast and I came home with something I'd wanted for a very long time ... truffle oil. I'm not sure why I waited so long (actually I do, it's expensive) but I have to say, it was one of the smartest choices I've made in a long time. I baked the whole thing up and it was pretty outstanding. Cheesy and rich ... and with just four or five little drops of oil, totally bursting with the truffle style. With a bite of the egg dish, that salad really sung. Awesome. I forgot to take photos so forgive my Flickr theft, but I had to show you something from our most recent trip to Mercadito. Friday night was a pretty miserable, rainy mess, but we decided to meet up with a couple of Meena's friends from work and attack some chic Mexican like it was our job. Pretty insane. 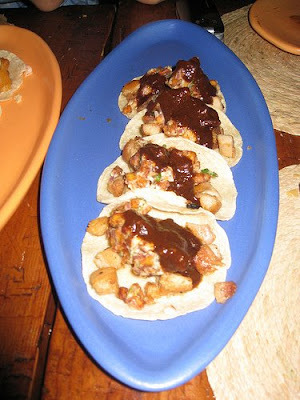 It's amazing because the tacos are so small and you think you're eating next to nothing, but after a few bites, you realize you're stuffed. Totally. Completely. Stuffed. But it was all SO good. The orange guacamole was the table favorite and we actually ordered a second round. It was really spicy, but whatever pepper they used really gave it FLAVOR on top of the heat and creamy butter pear. I think the pibil tacos were my favorite. 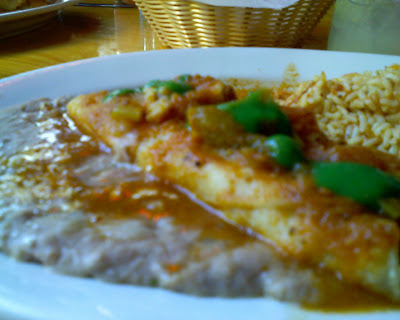 Meena liked the baja fried fish joint. 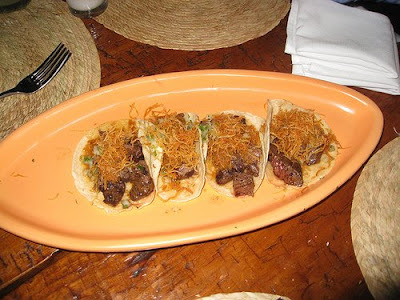 But they were all good and if you're ever lucky enough to try Mercadito in NYC, you'll see what I'm talking about. 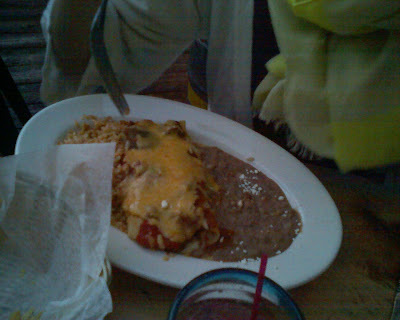 It's easily the best Mexican I've ever had. I went to my last Rolling Stone/Men's Journal party last night and although the event was pretty stellar, the ride home was pretty much the worst ever. I started in a cab and finished on the train and it took me about an hour and a half. It should have taken about 20 minutes. So by the time I got home, I'd missed much of LOST and I wasn't a happy camper. 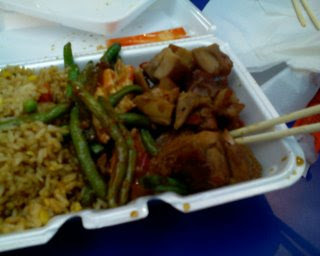 But Meena had been kind enough to order some nice stuff from Chance, our new favorite Chinese spot in the hood. So once I had some nice, comforting Chinese and took up residence on the couch, things got better. I think we'll stick with Chance from here on out. They seem to be doing this thing right. 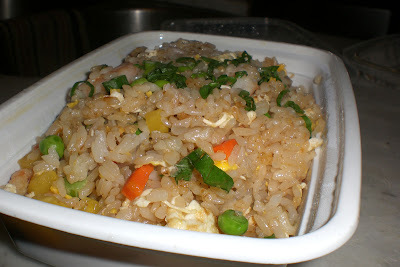 I saw this little post on tastespotting yesterday and it piqued my interest. It didn't have a recipe and I'm sure whoever did it on there probably did it better than me, but I figured I'd give it a try. Why not, right? Other than the fact that my eggplant took on the flavor of a grassy apple, I'm going to go ahead and say I was pretty pleased with this dish. This was the first time I'd ever worked with eggplant, so I'll get better at that. I promise. But at the end of the day, I was pretty pleased with this thing. 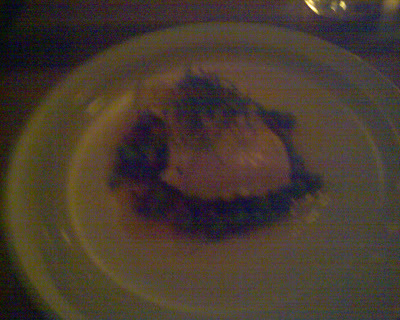 I thought the fish took on a lovely hint of rosemary and it was simply perfect when paired with the bacon. I have an event to hit tonight so I'd guess you'll see some delivery in this space later on. Sorry 'bout that. But it's just the reality of a busy person! Yeah, I don't know. We had planned on cooking but it was nice and Meena was just like ... dude, we're going to Lobo. I didn't put up a fight. At all. Because let's be honest, I want to have Lobo always. As always, it was pretty satisfying. Not a bad Tuesday. Not a bad Tuesday at all. Although this is commonly referred to as a garbage pasta around our household, it’s very much NOT a garbage pasta by definition. See, in order for our pasta to be deemed garbage, it needs to featured a flurry of ingredients culled from the remnants of our fridge. And although this did utilize that category of ingredients to a degree, I did in fact visit Pacific green to secure a handful of ingredients with this very recipe in mind. So I say … this is not garbage. And fortunately for us, it did not taste it either. This was actually one of the better simple pastas I’ve made in a minute and I was pretty pleased with myself at the end of the meal. See, simple, right? Well. Not as simple as I would have liked, actually. I think the best pasta has like 3 ingredients. Mine has about four times that. But still, it only took a few minutes to throw together and that was really what we were after more than anything. We had people coming over to view the apartment (we’re moving again) so we just wanted to fly through it. The tomatoes were sweet and the ham was salty ... so we were pretty pleased about that flavor combo. Surprisingly, Meena and I had a successful flight home on Sunday that included not only on time departure and arrival, but our checked luggage greeting us at the baggage claim the second we approached it. Not bad. For dinner, we really didn't feel like cooking. And honestly, after that massive lunch, we didn't feel much like anything at all! So we figured a little Joya delivery was just what the doctor ordered. So order we did. It was just right. All I needed was a bite of Meena's pad thai and a bit of the most lovely soup in the world. Man. I love Asian soups. Miso. Hot and sour. Tom yum koong. They're the best. Anyway, it was a good weekend. Great even. And we really felt good about seeing family and checking items off the to do list. Fantastic. Sunday morning before we left Milwaukee, we were treated to something pretty spectacular - brunch at Westmoor. I guess the Roell's joined this lovely little club recently and for mother's day, it was decided we'd check out their brunch spread. From seared scallops and lobster tails to rock crab claws and so much smoked fish it's insane, the spread was seriously a little bit of amazing. 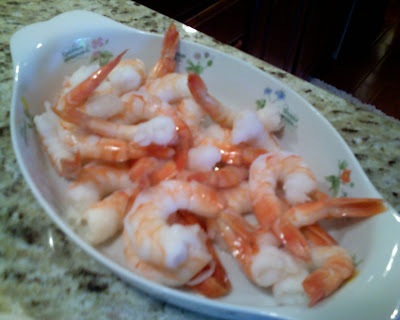 There was a hot section with prime rib and all of that stuff and the cold section (my favorite) that housed my favorite smoked scallops, seafood salad and mountains of shrimp. In addition to the food, we also had a spread of desserts that were pretty spectacular. I didn't have much (I went back for more smoked fish when everyone else did dessert) but I did end up having some and they were pretty awesome. Excellent mom's day meal. I hope we get a chance to go back someday! Saturday night was family night. We had been to Madison during the day for all sorts of stuff related to picking out tuxes and getting our engagement photos taken. And after the night we'd had trying to fly to Milwaukee, we were pretty tired after the trip to and from the People's Republic of Madison. But that wasn't going to prevent us from playing with babies! That's right, Brian and Nikki brought their whole crew over and Meena, Mrs. Roell and I made some dinners. And Mrs. Roell and Meena finished off the rest with a wonderful beef tenderloin wrapped in bacon and some fantastic fruit salad. Mrs. Roell manned the grill and Meena did most of the chopping for the fruit. Lovely. At the end of it all, we were treated to some birthday cake in honor of Brian's 29th big day. Mrs. Roell picked up a nice one at Sendiks and had it decorated with some fancy black icing. Very chic. Anyway, it was a great night full of babies, laughter and grilled meats. I couldn't have asked for a finer Saturday night. We were flying home to Milwaukee to knock out a few wedding tasks Friday night and of course, because it was raining ever so slightly, we were delayed about 3 hours. You know. Just standard stuff. So once again, we spent a Friday night in the airport. 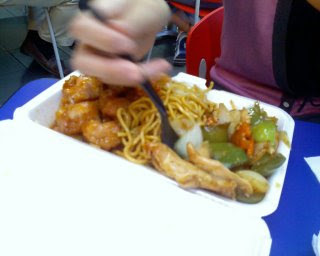 Eating crappy Chinese food. I don't know why this is our thing, but it just is. We eat it. We don't even think about it. We just go right there and house it. It's just uncontrollable. I don't even remember what we had. I don't even think it matters. It was an exhausting night. But at the end of it, we were in Milwaukee! I don't know why we decided on these but it just seemed right when we were thinking about foods for tonight's dinner. And we had a bunch of stuff at home. That's a lie, actually. We bought tortillas, poblanos, an onion and salsa. Which is like 80% of the ingredients. So yeah. I was lying when I said that thing before. Anyway. Not bad. They didn't look all that visually appealing, but they're quesadillas. So whatever. But they were good. We used the small flour tortillas so I didn't think they'd be super hearty, but they were. We were both mad full at the end. Delicious! We're heading back to Milwaukee tomorrow so it might be a minute before we post again. But you never know. I'll try! Last night we decided to use some chicken we had in the fridge and get a little crafty with some leftover coconut fried rice from Meena's dinner the previous evening. It might not sound like much, but I have to be honest ... this was one of the better meals we've made in a minute! We then served it all up with some Boston lettuce, that coconut rice and a bit of sambal oelek. I mean, it might not sound like much, but it's seriously one of the best things we've made in recent memory. Little Asian inspired tacos with lots of lovely chicken, garlic, rice and spice. I know the formula isn't all that creative, but whatever, man. I'm all about taste, not impressing the internutz. And this my friends, was delicious. We were given the opportunity to attend a gala after party at the Rainbow Room last night for Steveo's Manhattan School of Music. We'd never been up there and it was a good event to try and help out the school a little, so we figured we'd jump on board. Glad we did! It was a ton of fun. Before we went, however, we had to get some food in our bellies. And instead of dealing with the normal flock of delivery spots, Meena decided she wanted to do something different. And after experience the delivery from Chance, I'm glad she did. It's essentially just Chinese delivery. But it's more like a PF Chang's style Chinese. Meena had the winner. Her sesame beef was pretty rad. The veggies were crisp and delicious. And the beef was a little crispy, sweet and tasty. My chicken was OK. I added some sambal oelek and it gave it a nice bit of spice. My hot and sour was actually excellent. I'd order from there again for that alone. Anyway, good night. Thanks to Steveo for allowing us to attend his wonderful event and thanks to Chance for some rad delivery. I was leaving the office last night and I heard one girl say to another, "Are you having a margarita tonight for Cinco De Mayo?" The other girl, totally serious, replies, "I don't celebrate that holiday." Like it was offensive or something. Come on, girlfriend! It's Cinco De Mayo. Nobody I know REALLY celebrates the holiday. It's like Bastille Day. You don't REALLY celebrate, but you do eat some baguette and drink some red wine, right? Whatever. It was just massively annoying to me for some reason. So I decided that not only was I going to work some tequila into my dinner, I was going to make a margarita when I got home, too. I garnished the whole thing with some watercress. Not bad. 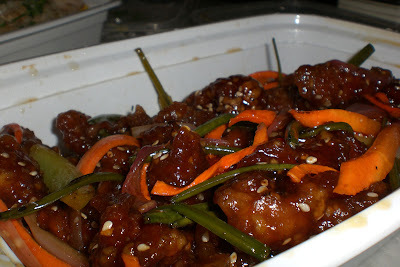 Couple things wrong here ... the tequila glaze wasn't as flavorful as I thought it would be. I should have added a little honey and a little more lime juice. That would have increased the "glaze" nature a little. 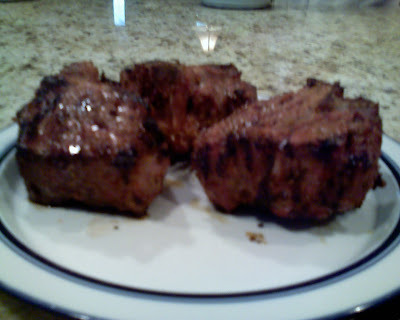 I think the pork chops weren't as good either. We tried a different type from the butcher and they just weren't as awesome. They were smaller (which was the motivation when we bought them) but the flavor just wasn't there. So ... next time we'll go back to those big suckers. Anyway ... not bad. Not great. But not bad. When I lived in Indy, I would have lunch fairly often at this little restaurant in a department store with Dad. It was a little cafe type thing and they had pretty good stuff. It was relaxing. Anyway, one of the things Dad and I ordered from time to time was this black and bleu salad. Nice bits of steak and some bleu cheese crumbled all over. Pretty classic combination and fairly standard recipe, but I did really enjoy that particular one. Anyway, after a long day yesterday, we just decided to keep it simple last night. Watch some TV, cuddle up on the couch and down a little steak salad. The only thing that wasn't quite right here was the bleu. It wasn't all that solid. Just one we picked up at the grocery, but it was too creamy and not crumbly enough. That happens. I just wish it didn't happen to our salad. 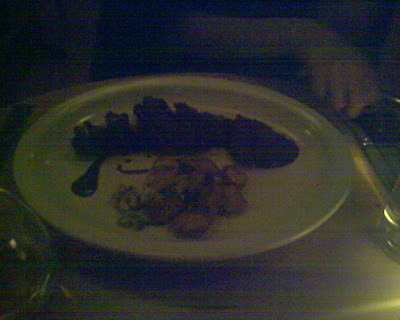 The skirt steak was an oddly fatty one as well. I thought I trimmed most of it, but there was some marbling I didn't (or couldn't) see. 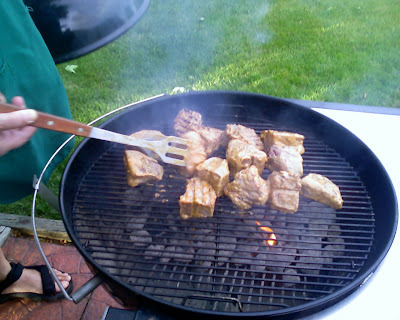 It's not the leanest piece of meat in the world, but it's typically leaner than this was. Of the two butcher steaks, I think hanger is our favorite. It's pretty much never fatty in the way this one was. NO biggie. I think this was still pretty awesome and not a bad way to close out the weekend.